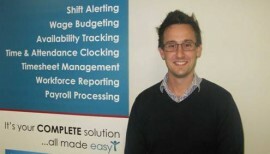 Staff in Focus Series: Kristian, Service Delivery Manager. At HRMWEB our mission is to assist businesses to better manage their workforce – that’s because we believe that people are a business's most important asset. Now we give you the opportunity to find out a little more about the people who work at HRMWEB. LEARN HOW TO SAVE TIME, SAVE MONEY & GAIN CONTROL OF YOUR BIGGEST RESOURCE!